My name is Nick Kho, you might also know me as RSD Papa. I am the co-founder of Real Social Dynamics with Tyler. I’ve gone through 2 MBA business school programs, and I’m still continuing my education by working on a masters degree of legal studies at Harvard University. I’ve spent over a million dollars on my education outside of formal institutions, I’m an exclusive member in many of the top mastermind groups, and I have the privilege of calling other top leaders in a vast variety of industries across the world as my friends. My professional circle is full of other highly successful people whom I learn from and who, in turn, learn from me. Thanks to the pick up skills I developed, I’ve dated some of the most gorgeous women in the world. Thanks to the leadership and business skills I acquired, I became the CEO of an extremely successful multinational company. Thanks to the advanced networking skills I learned, I built a professional network of elite and powerful people, and now I am a part of high end social circles filled with famous and highly influential people. Thanks to the communication and relationship management skills I cultivated, I was able to create strong and long lasting personal, social and business relationships. If I hadn’t created RSD, none of it would have been possible… but the crazy thing is - it wasn’t always like this. Building RSD has been a long journey full of ups and downs - with many different experiences, struggles, and lessons along the way. When I started - I had nothing… In fact, I was in debt. I was raised in a very conservative Asian background. Growing up, I always had my nose in books and my career choice was already set for me. My father expected me to work in finance as an investment banker in New York City in a big firm like Goldman Sachs. My parents looked at each other and they started laughing hysterically, they laughed so hard tears started rolling down their face! They said that was the funniest thing I have ever said. Then... they realized I was serious. Right away, they threatened that they were going to disown me - they were going to cut me out! But that didn’t matter, I wanted to pursue my passion and build a business around it. Nothing was going to stop me. It wasn’t easy. Especially because - not only did I have no money… I was actually in debt! This was the beginning of a long journey… Tyler and I would hustle around-the-clock to build RSD. We would scrounge up whatever money we could to travel from city to city, most of the time - we were homeless - crashing on people’s couches (or in the back of my 1997 Toyota Avalon) just to connect with other like-minded guys who were passionate about pick up. Little by little, we built up a following of loyal fans, we nurtured it with video after video focusing on delivering MASSIVE VALUE, and eventually we saw the hustle start to pay off. It took years upon years of hard work, dedication, passion, and borderline madness to make the company into what it is today. Today, RSD has been going strong for 14 years and counting! We’ve outlasted every single competitor in the hyper-competitive niche of dating success training, and we've successfully met and exceeded all the challenges that has been thrown at us along the way. Day after day, we continue to make massive innovations in the content we provide, and we’re always adapting and evolving regarding how we deliver our products and services. For the first time ever, we are proud to announce that we are finally taking you BEYOND THE GAME. Real Social Dynamics is among Inc Magazine’s “Inc 5000” List, ranking as the 860th fastest growing private company in the world based in the USA. It’s also the 60th fastest growing private company in the Los Angeles area and the 59th fastest growing Consumer Products & Services company in the U.S… and we’re still growing! We operate in 270 cities and 70 countries, offering 1000+ live programs a year, with 1000+ people working for us around the world! For the first time ever, I’m pulling back the curtain behind RSD’s success so you get to see exactly how a multimillion dollar company runs and operates. I’ll share the inside history of RSD’s humble beginnings, and the the key strategic business decisions along the way that turned it into The World’s Largest Dating Coaching Company. I explain in detail the different moving parts of the business and how they interact to create a highly successful company that inspires amazing passion and loyalty from clients. You’ll learn valuable business lessons and practical strategies to finally break out of the 9-to-5 grind, start your own business, or grow the one you already have. One of the reasons that RSD has been such a successful and highly profitable company is because I’ve taken the phrase: “Field Experience is King” to a new level. I’ve taken the pick up techniques and field-tested principles that allow you to get hot, gorgeous women - and applied it to my business. Regardless of what stage of the game you’re in, you can start to form relationships with high end people right now, The thing is - you have to know exactly how to approach and engage important people so they are open to you. I’ll show you the mindset and step-by-step method to engaging and establishing relationships with CEOs, industry leaders, and other powerful people. This is the best way to find a potential mentor or the next investor in your business! I’ll show you the inside secrets to gain access to the most exclusive venues of the world. I’ll teach you how you can create a huge social circle of beautiful people to have fun and party with. And, I’ll also show you how you can hang and make friends with celebrities - especially if you live in a major city like LA, New York or Miami. The principles within RSD Founder’s Club are applicable to ALL areas of your life, including maintaining a long-term relationship (if that’s what you want). I’ll share with you an exact blueprint to create and maintain a fulfilling relationship where you and her both grow. The bond between the two of you will only get stronger as a result. When you know how to approach your relationship in the right way, you’ll have your girlfriend so addicted to you, no other man will even come close in her eyes! RSD Founder’s Club is a culmination of everything that I have learned over my years of building Real Social Dynamics. RSD Founder’s Club is carefully structured step-by-step curriculum full of information that you can implement immediately to see incredible results in your life. I’ve put every single hard-earn lesson I’ve learned into this program - I’ve left NOTHING out. You've been following RSD, you’ve been following RSD Nation, you’ve been a part of our community. Through it all - you too have gotten that personal transformation and identity level change. Some of you may be at a point where you’ve already gotten massive success with pick up, and now you want to find out how you can take this success and apply it in other areas of your life. There is nothing in your social life or business life that cannot be accomplished if you're willing to put your mind to it. It’s even faster when you have the right mentors and guidance. That’s what RSD Founder’s Club is all about - it’s about giving you the tools you need in order to develop the skills that you want. Wouldn’t it be awesome, if someone spent over a decade building a global business, and then went through and tested every possible scenario? Wouldn’t it be awesome, if someone took it upon himself to take the lessons learned, and summarized the lessons and take-aways and put them together into a highly-digestible format? Wouldn’t it be awesome, if someone took all of that information and made it available for you. Wouldn’t that save you the insane amount of time and effort it would take to learn yourself through trial and error? That’s exactly what RSD Founder’s Club is! For the first time, you can take the skills you’ve learned in pickup, and start applying them to every area of your life. For the first time, you have the ability to achieve results not only with women, but with your entire social circle, network, and business goals. For the first time, you have access to a success framework that is going to serve you for many years to come. If you continue to miss out on opportunities - your life will never change. Every hour that you spend wondering whether or not you are doing the right thing for your future means that you are not executing - it means that you are not actually moving forward. RSD Founder’s Club is a culmination of YEARS of hard work and dedication, it has been created to provide you with the tools you need in order to achieve extraordinary results not only in game, but also in your personal life, within your social circle, and in your business. The A - Z guide to living the kind of life they write books about! This is the most comprehensive collection available of field-tested pickup knowledge applied to all dimensions of human communication ever assembled. All the information you’ll ever need to succeed in every single area of your life is contained right here in these videos. Papa has taken everything he knows about pickup, business, networking, socialization, relationships, and laid them all out into individual lessons for you to follow. It’s a no-holds barred, take-no-prisoners program with only one goal in mind - complete and ultimate life transformation. 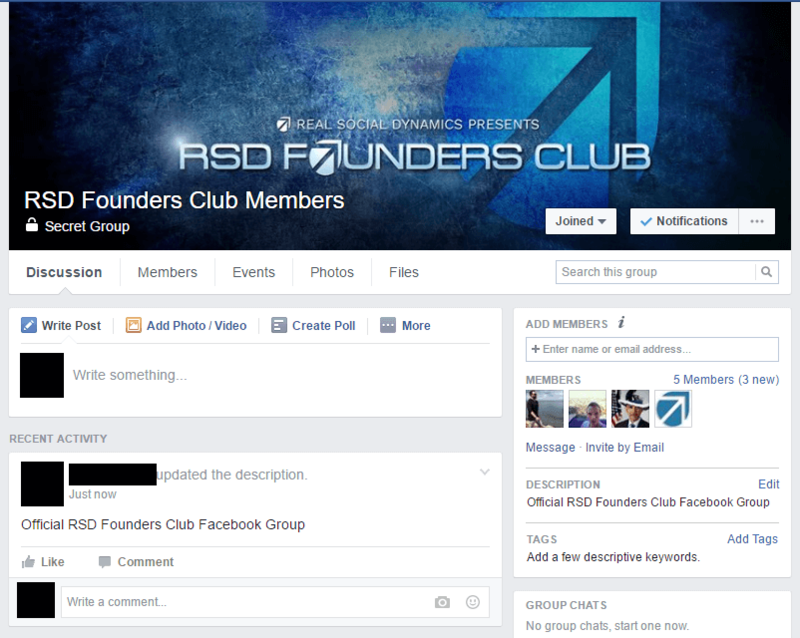 Gain access to the invitation-only Facebook Group for members of the RSD Founder’s Club. This group is EXCLUSIVE for those of you who are passionate about achieving a high-level of success in EVERY area of your life. Here you can give and receive feedback as you all go through the program together. You become that which you surround yourself with - so take advantage of this opportunity to connect to other like-minded individuals. Think of this as your personal mastermind group that is there to support you and push you to break through any barriers which are holding you back. 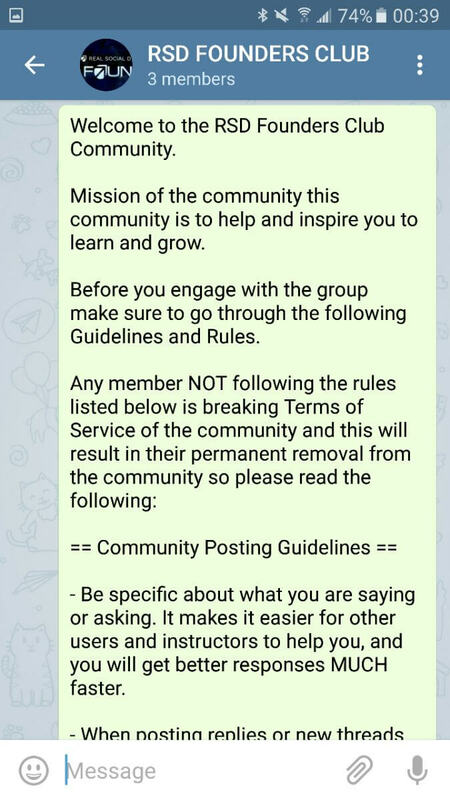 This is a community that’s there to give you support and accountability in order for you to achieve your goals. With the RSD Founder’s Club Phone App, you will be able to connect with other RSD Founder’s Club members in REAL TIME. The phone app is available for download on your smartphone as soon as you sign up to become a member. This is like having a “Mentor in your Pocket” because you can give and receive feedback in real-time, and meet local members in person and expand your circle of cool successful guys to have fun and hang out with. It’s be there for you wherever and whenever you need it. The pursuit of success is non-stop process, you never know when you will have that critical moment and need immediate help. Through the official phone app, the RSD Founder’s Club Community is right there with you every step of the way. With RSD Founder’s Club, you will get access to 12 Weekly Interviews with Experts from Papa’s Elite Social Circle. Get a glimpse of the vast network of very influential and powerful people who call Papa their friend, and get their high-level insights downloaded directly into your brain. This is a unique opportunity to see and hear from people who carefully limit access to them. Whether you are looking for mindset tips, success knowledge, marketing advice, branding direction, or pretty much anything else under the sun - these interviews got you covered. These people are extremely busy and don’t normally provide interviews, but they are available exclusive to you as a member of RSD Founder’s Club. This is like have a shortcut to every mentor you could ever imagine. Get an inside look into how CEOs, top business leaders, and heads of industries run their life, and their business - within this exclusive RSD Founder's Club Mastermind Group. With RSD Founder's Club you are getting a very rare chance to enter behind closed doors of a super exclusive Mastermind Group. Take this opportunity to carefully observe how high-level individuals operate, so you can copy replicate their results for yourself. After this, you have no excuse to not succeed. After you’ve successfully completed the RSD Founder’s Club program, you will be given a formal invitation to enroll in a direct 1-on-1 mentorship with Papa. You’re getting an extremely rare opportunity to have Papa take you under his wing and personally guide you to achieve the goals you've set for yourself. In the past, Papa has never accepted personal mentorship applications, and there is no telling whether or not he will do it ever again - this may be your only chance, no joke! And as a member of the RSD Founder’s Club, you can do it without having to move closer to his location or shelling out thousands of dollars as other students have had to do in the past. Completing the RSD Founder’s Club training demonstrates that you are 100% serious about transforming your life for the best, and you’ve committed to doing the necessary work to get there. That’s why you automatically become eligible for a one-on-one training with Papa. This isn’t an opportunity you’re going to want to pass up. Build a social circle filled with high status, influential people, and highly successful, driven people. Create stronger long-lasting relationships with your friends, loved ones, and the women in your life. Uncover the hidden lessons in pickup you may have never been aware of, so you can easily apply it to all other areas of your life. Take the pickup rapport skills you already know to establish common ground with new business partners. Use the insights within RSD Founder’s Club to outmaneuver, outsmart, outdo your competition, and dominate in your field. Develop a winning mindset that will help you build and grow a business, to dominate your market or niche, and to be successful in every area of your life. As soon as you get the RSD Founders Club, you will experience a real transformation. You will begin to see how all of the different pieces - life, money, and relationships moving together. You will no longer have to guess - every move, every decision you make will be clear as day, and once you finally ‘get it’, you will never look back. Your current reality will shatter, and a new reality will take it’s place. If you miss out on this important concept - You will NEVER SUCCEED! If you don’t get this one thing right - NOTHING you do WILL EVER WORK! As soon as you can accept that you are in control of your own destiny, your own skillset, and your own future - That is the moment you can finally start making a REAL CHANGE in your life. With RSD Founder’s Club, I wanted to create a program where I can share my lessons about money, power, elite access, masterminding and the social graces that you need to learn to get the massive success in your social, your business, your personal or your family life. With RSD Founder’s Club, you won’t just get the tools - you will get the tools, and you will learn HOW TO USE THEM. I created RSD Founder’s Club because it’s a resource I wish myself I had when I first started. getting access to all of the take-aways - INSTANTLY! Whatever way you want to look at it - RSD Founder’s Club is pretty awesome. Passionate about achieving your goals in life, regardless of the obstacles in the way. Ambitious and dedicated about getting to the highest level of self-development possible. Driven to get the best skills possible to evolve your life to the highest. Excited about applying your pickup skills to every other area of your life. You want to live a lifestyle full of financial freedom, amazing experiences, and fulfilling relationships. RSD Founder's Club is the opportunity that you never had, it's an ability to discover and maximize your true potential. RSD Founder's Club plugs you into the future you've always dreamed about living. If you want to increase your productivity, your results, and your lifestyle. RSD Founder's Club is for you. Over 10 Hours of Content Covering 600 sub-topics and 60 major topics relating to Dating & Relationships, Social Game, Networking, Business, Mindsets, and Behind the Scenes of RSD. Get exclusive interviews with experts from within Papa's high-level Mastermind Group. These interviews uncover the secrets of high-performance and give you the low-down on stepping up your game. Papa has access to an elite social circle, this is your one-in-a-lifetime chance to get access to the thought processes of some of the top performers across a wide variety of industries. After Completing Week 20 Video Trainings, and After September 1st - Applicants May Apply for 1-on-1 Training with Papa. Papa has never done this before, but for the first time ever - he is giving you the opportunity to get mentored by him personally. That means you can leverage all of the insight and the power that Papa has accumulated over the years for your life, and in your business. An EXCLUSIVE book directly from MyGameTheory. This book dives DEEP into human psychology, filled with neuroscientific explanations for everything from why game REALLY works, to curing depression, anxiety, and even achieving a "heightened" or "enlightened" or state of mind. Get an exclusive invitation to attend Papa's Live Group Mastermind Session in Las Vegas, Nevada - This event is ONLY available to our top members. We will cover foundational and advanced concepts at all levels, this is a must-have to give you the in-depth insights that you need to advance to the next level. A video of one of the best presentations that RSD has done over the years. In this Business Success Blueprint speech, Papa uncovers the strategies, tactics, and execution methods that top performers use to achieve masterful and high-powered results from their every move. On top of that, he shows you some tricks and tips that you can use right now to optimize your life, your business, and your social circle. Get a chance to hear from Papa live and in-person as he opens up the vault of potent, high-performance techniques that are proven to deliver dominant results. Get the opportunity to ask questions, and really hone in on the things that are going to push you above and beyond where you are. RSD Founder’s Club is probably the most unique product that RSD has ever created. First off, this is the first product of it’s kind that tackles business, success, and networking. Second, this is the first time that RSD Papa has released a product of this caliber - RSD Founder’s Club touches on every level of game - there is nothing else like it. Third, this is the first opportunity that you are going to get to receive training from someone who is an actual FOUNDER of a global company. On top of that, RSD Founder’s Club is different from every other product out there because it is created by an actual FOUNDER of a global company. RSD Founder’s Club contains REAL, ACTIONABLE steps you can take RIGHT NOW. RSD Founder’s Club is completely unique - it has created with you in mind, and never before has so much knowledge been to you. It is the only product in it’s class - it’s been created especially for those who are passionate and dedicate to their own future and development. To develop an uncanny ability to hone in on your own success barriers, and overcome them - INSTANTLY. To know that the next time you are in a room with a person of great power, you will know exactly what to do to get them on your side, but also - be able to do it in such a way that actually makes THEM want to do business with YOU. To wake up tomorrow, and feel as though you could conquer anything - whether that’s a personal challenge, a business goal, or a larger spiritual conquest - the tools you need are at your disposal. To realize that you no longer have to “guess” your way to success, with RSD Founder’s Club you have a clear map and direction that will take you exactly where you want to go. To save yourself OVER A DECADE of trial-and-error, and cut your learning curve in HALF. To have the time to focus on the things in your life that you ACTUALLY LIKE DOING! We're willing to GUARANTEE your results. Get the The Founder's Club...in fact... get it with the INTENTION of scamming it. If after 30 days it doesn't deliver 10x the value - refund it. Get the The Founder's Club, try it, and if it doesn't completely change the way you live your life - get a refund. It doesn't matter if you are already advanced - you will discover nuances that you never saw before. The Founder's Club is a phenomenal program. That's why there's a 30-day money back guarantee. The content inside of RSD Founder’s Club is so powerful, so life changing, and so impactful - that I personally guarantee that you will experience a massive transformation from it. You will be able to take my ideas, techniques, innovate on TOP of them, and personalize them to your needs. A lot of the mindsets that have worked for me might seem extreme at first, yet at the same time, those same ideas may inspire you and work for you. All of the business tactics, the skillsets, the networking, and the social life, are directly applicable to your life. I want to you link this moment to your destiny. I believe that you are awesome. Not even knowing you, I know that inside of you, you have amazing and awesome elements that are just waiting to come out. You have something special that you need to share with the world. I believe deep down that everyone has something to offer - if only they could be given the opportunity to take action, and are willing to show that they have the need, the desire, and the effort to push things forward. It’s not an accident that you are here right now. You are meant to be here, and you are destined for greatness. I have spent over a decade to bring this product to you. I have spent countless hours to make sure that the content within RSD Founder’s Club is something that has a lasting impact on your life - if you are still on the fence, just give it a shot, you have nothing to lose. This is a lifetime of knowledge I’ve combined into a program that I’ve spent countless hours on. I have guaranteed you that if you don’t get massive value from this you will get a full refund on your money. 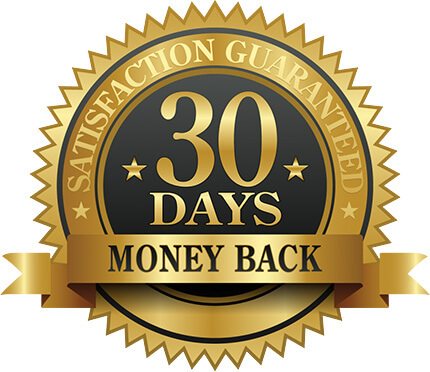 We have a no-questions-asked 30-day money back guarantee. Also, you have my personal promise that the RSD Founder’s Club will be one of the best milestones on your journey to success. I want to take a moment to thank you for being with us. I am very excited to see what you can accomplish with this program, and to guide you every step of the way. If you haven’t already - click the “Buy Now” button on this page, and take the first step. The interviews were amazing by the way, and the networking module was so full of value. I liked the interviews because it gave a way a two way narration of a certain problem. For example, when Nick asked Derek about his business education Nick explained his history of business education, and thenThe lesson I enjoyed the most was about how not to be affected by money, but I don't think I've internalized it and I'm happy that Nick is not affected by it. Derek shared his. Also, I bought this program in order to help me with networking, and that is what I enjoyed the about the module. Thing is, now that some of my questions were answered, so many questions arrived. Really just learning about RSD, and Larry Benet was a great experience. It's good to know about a company that one looks up to. - Juan A.